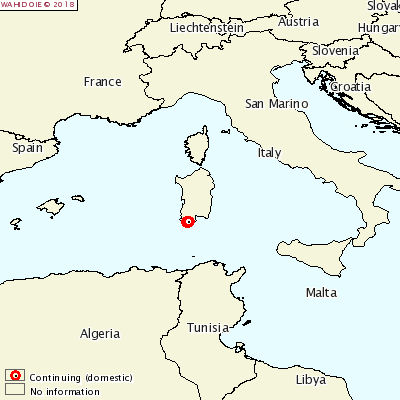 On 5th of October 2018 the Italian Ministry of Health notified to the World Health Organization for Animal Health (OIE) 8 outbreaks of Bluetongue virus-serotype 3 (BTV-3) in Sardinia, Sud Sardinia province, municipality of Teulada. The date of confirmation was back to 3th of October when positive results in real-time PCR were given. On the whole, 100 clinical cases were notified, of which 96 in sheep and 4 in goats with an apparent morbity rate of 6.03% and 2.00% respectively. This is the first notification of BTV-3 in Sardinia. The first time BTV-3 was notified in Italy, Sicily-Trapani province, dates back to the last epidemic season, in November 2017, when a 3 years old female crossbred sheep belonging to a flock located in the surroundings of Trapani (Western part of the island of Sicily, facing the peninsula of Cap Bon) showed clinical signs later confirmed to be attributable to BTV-3. The virus identified in Sicily was identical to that of BTV-3 TUN2016, first detected in Cap Bon in November 2016.